You just need to create an offline wallet address at first. You don't need a personalized "vanity" address. I'd invest in a 'practice' address first if you haven't used the XRP Ledger extensively. You can start out by practicing on the test net, but I recommend people ultimately practice on the main networks because everyone internalizes things better when real value is at stake. The reason I say 'practice' first is that if you are creating a charity you want many people to trust with large amounts of value, then you are going to need GREAT security practices to manage the secrets behind your addresses. Almost nobody implements GREAT security practices when learning. Don't pretend you are smart enough to do so. Just create a practice address, take all the steps, send and receive some test payments, integrate it with your voting processes. Picture one below. I know how to click the generate credentials button but then everything gets a little too technical. I have tried copying and pasting those two address looking things on the right (by the black arrows) but they send me to pictures 2 and 3 below respectively. I'm guessing they're not even website addresses and I'm using them wrong? Below is an example of what I am thinking when I look at one of these pages. Basically I have no idea how to get onto the testnet and I can't find the step by step instructions of how to. Weirdly enough I have a feeling I could generate a real address offline and register it to the XRP ledger with the 20 XRP. Do I go to the page below? Then take my computer offline and click generate. Then write the secret code down on a piece of paper and cut and paste address into word file. Close all the windows down and go back online again. Then send 20 XRP to the address and it's all done? I can't find the file to download where I can create the address offline by moving the file from the online computer onto one that has never been online and open the file on the second computer and generate the address there. but I think it is out of date because it's not called ripple-tools any longer it's called bithomp-tools and when I try to right-click "save as" it just saves a browser icon to my desktop rather than download a file so ferk knows what's going on there. I'm guessing you are use to conversing with people who know computers. I am aware they use hexidecimal code for colours and I'm reasonably good at minesweeper. That is the extent of my computer skills. 1 - ...In a year or two when I have completed a number of projects and have delivered everything I promised with regards to transparency and democracy then people will trust the process. 2 - ...Luckily this isn't an issue at the moment because I can't see my local cricket club executing a dark DAO to win the vote over my local library wanting a wheelchair ramp. ... In the beginning I don't think anonymity will be that important because not many will care if others know whether they voted for a wheelchair ramp or a new cricket lawn and I can't see hackers deriving much value from hacking the results to find out. I think you are approaching this quite rationally! I like the article about election hacking because that type of process affected past XRP giveaway programs. It is really nice to be able to study those dynamics. Picture one below. I know how to click the generate credentials button but then everything gets a little too technical. I have tried copying and pasting those two address looking things on the right (by the black arrows)﻿ but they send me to pictures 2 and 3 below respectively. I was really hoping someone else would jump in and help you. Come on folks, this is a new XRP Ledger users! What you've missed is this page. I missed it too when I first went to bithomp. This link gets you the test net configuration rather than the live network. Copy the "Address" above to the line at the top. 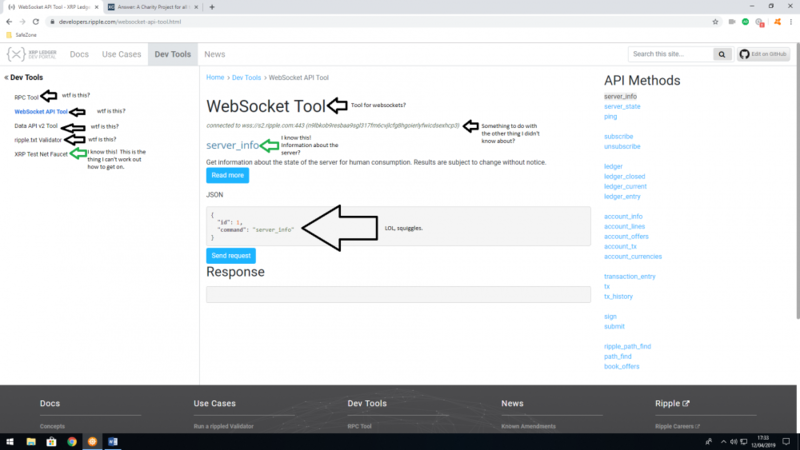 Then press the search button to view that address in the test net ledger. 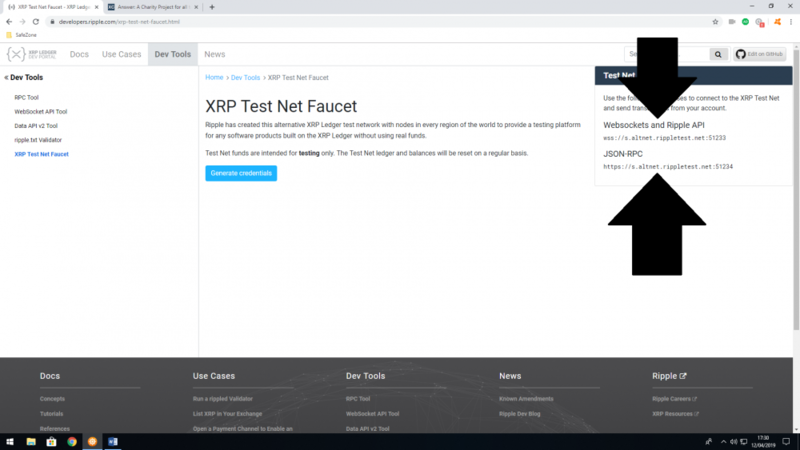 Here you can see your 10,000 XRP balance on the test net and the transaction that funded your address. NOTE: I spent 100 XRP out of this particular account while testing. See the end for details. Copy the "Secret" above to the line under "Paper wallet (secret key). That is how you submit transactions to the ledger. This creates a new secret and address, but that address IS NOT FUNDED. It only exists as that pair of numbers you see on the screen. If you search for that address in the test net explorer it will say: "Account is not activated yet." 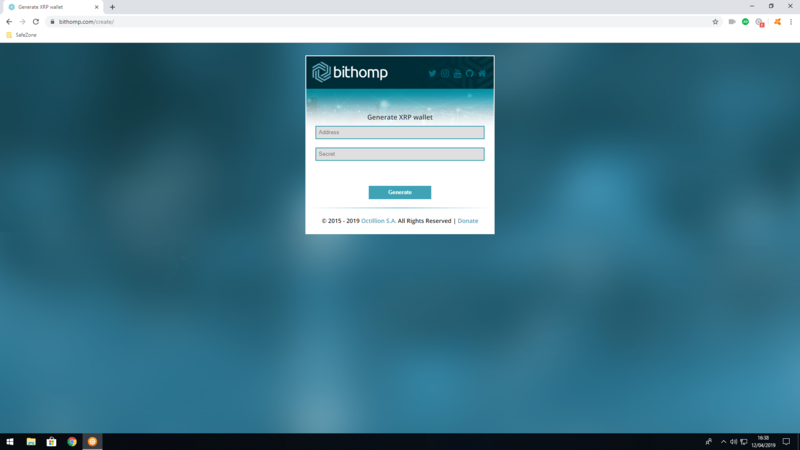 So go back to the previous "Bithomp tools" window and send the new address some XRP. At the bottom of the window, click "Check on bishop in 5 sec". This will show you the results of your transaction. 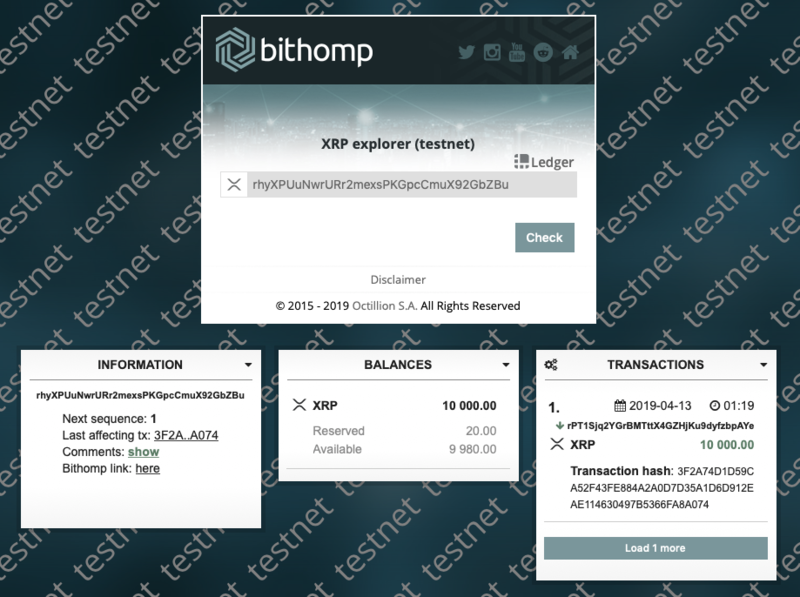 Now you can look at either of your addresses in the "XRPL explorer testnet" window and see what changed. Oh, yes. I funded this account while testing. That will give you a third address to play with. There seem to be too many fundamentals missing to effectively help in an async written format like this forum and if I really go into the consulting business and do hand-holding for someone who's reaction to a JSON-RPC call is "LOL, squiggles. ", I expect to be paid for it above market rates up-front. Whoa whoa whoaaaa calm down t1t lips. Let's bring you down off that high horse and if you could stop polishing that L33t c0d1ng PwNz0r trophy while we put things into perspective quickly. I don't need to be a mechanic to drive a car but I still need to be taught how to drive a car, just like I don't need to be a coder to create a wallet on the testnet but still need to learn it. I can change a fuse in my car, change the fuel pump and change the oil without taking the car to a garage just like I will learn how to create a multisig wallet and split keys without hiring a coder. 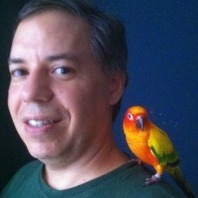 You say there are too many fundamentals missing to help....yet Bob was able to give me a quick how-to and I am now able to create my own wallet and send/receive payments on the test net as well as create a wallet and secret offline so I'm afraid there's no holding hands for you, Bert. And yes my reaction to JSON-RPC is LOL,squiggles because it's basically another language that I've zero experience with. Just like your reaction to a paragraph of Mandarin Chinese would be "squiggles" if you had no experience learning the language. Ok with that out the way you can go back to your trophy and high horse. ...........I hope that gets you started! Hi Bob I'd like to give a quick update of where I'm at which will include a few questions. The bold are things you have said. Getting the money into the system is always the hardest part. Especially for non-cryptocurrency savvy people. You are going to need a good website with a step-by-step guide for doing so. Currently, the ways I know to get cash into the XRP Ledger involve existing cryptocurrency exchanges and their associated "gateways". 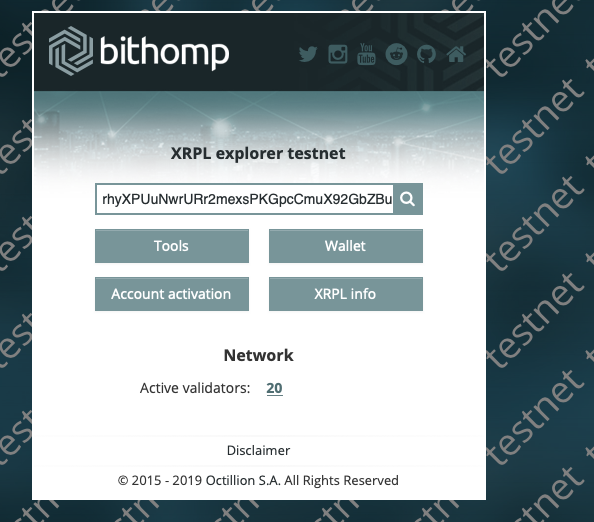 Bitstamp is one example of an exchange that also has an XRP Ledger fiat gateway. I think building or identifying a list of all the other functioning fiat gateways would be helpful here. This is also a great motivation to brainstorm new "cash in" ideas. Really what you are doing with the XRP Ledger is representing on the public ledger, fiat funds held by particular people at particular places. Such as "10,000 EUR in V4T's account at Bitstamp that belongs to the charity. Each of the underlined concepts are easily represented on the XRP Ledger for all to see. 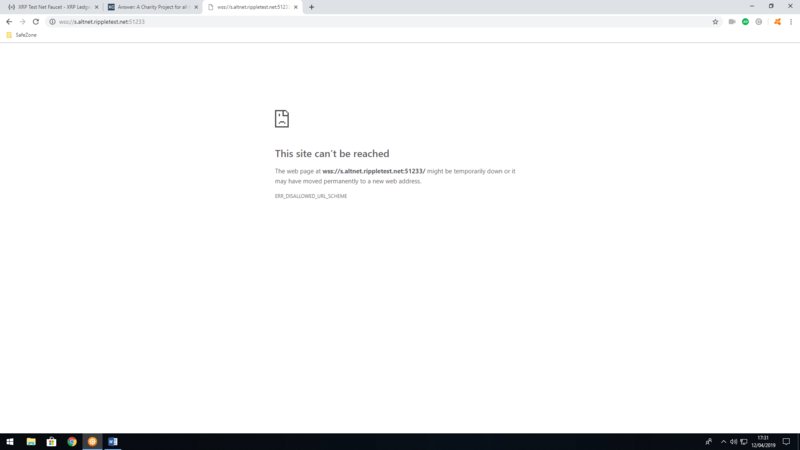 I tried setting up a Bitstamp business account but they wanted a bunch of official business details which is a bit beyond where V4T is because I am unable to register the charity officially so I am quite limited with what I am able to do at the moment. I have decided to set up a cold wallet via bithomp using your process (thank you for the guidance!) for the monthly winner from the voting arena. I will store all the donated funds there in XRP in these early days and will manually send the XRP to an exchange and convert to FIAT to fund the winning project. I have decided to include a donate via paypal button with me manually convering FIAT to XRP and sent to the cold wallet thereby representing it on the ledger. I have asked Bitstamp about using the XRP ledger from my personal account but they haven’t replied yet. Regardless of anything the most important takeaway is that I am able to maintain complete transparency for all funds stored in the cold wallet which I will create offline so for now I am happy with this. When I create the wallet I can tag my domain and as many other details about V4T as possible so even though it's not officially official, it's still kind of official, as official as I can make it. The HTTPS certificate can refer to the charity's real world (incorporated) identity. It costs quite a lot of money for this certificate. I am not asking for large sums of donations in the beginning so I think it is unreasonable for me to pay so much for this when I am already paying quite a lot for everything else in both time and money. Once the charity is big enough that I am allowed to register officially with gov.co.uk then I will get the certificate because by that point it will be required. My website is secure for donators to input card details and the donated funds are stored in an cold XRP wallet and it’s only small amounts of money so I think waiting until the charity is officially registered is ok. I would create the charity's address completely offline. This is a quick question about creating the offline cold wallet. 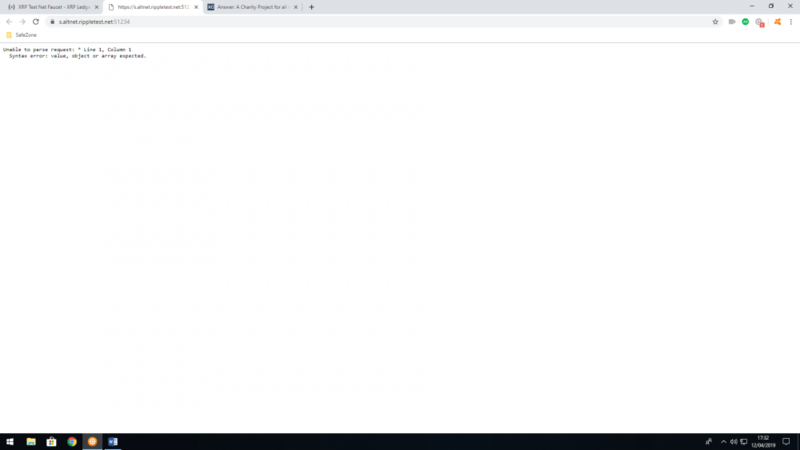 I don’t have a pc or laptop which hasn’t been online, can I just remove the ethernet from my computer and open the index file in incognito mode on the same pc I downloaded it onto, get the address and secret, write down the secret and store the address in a word file, clear the cache then go back online again? Would it just be a case of having to trust my PC? And is there anything I can do (virus scan, malware scan etc) before creating the wallet which will decrease the probability my PC is unsafe? Just because it’s still early days and very little money is stored in the cold wallet I am assuming airgapping to a laptop/pc that’s never been online is overkill atm. I would then store the master secret on paper (or some other permanent representation) and keep it in a safe deposit box while you are getting started. But before I locked the master secret it away, I'd generate a second "regular key" secret to use for the charity's daily signing needs. It is this secret I would protect using a ledger nano (or other hardware wallet) at first. Keeping the master key separate but still active, allows you to recover from a lost or compromised regular key incident. You might end up losing some funds, but you won't lose control of your entire XRP Ledger identity and relationships. Do you think I should learn this now? 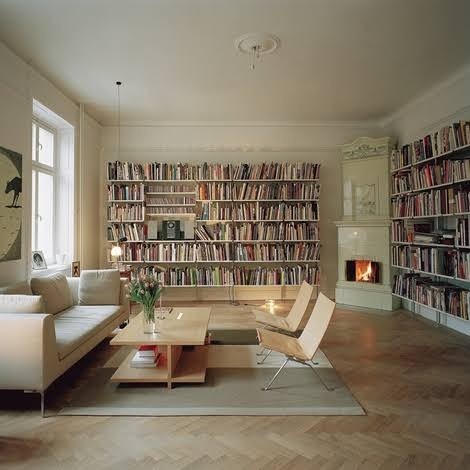 This seems like super-mega-ultra-overkill? Smart contracts are good for automating the transaction signing part of the process. You might replace the daily 3 of 5 multi-signing with a smart contract authorized to spend the charities money. But likely, information from a human or legal "oracle" would need to be input to that smart contract operation as well. This is about the underlined red part. This has nothing to do with V4T, just me being curious. Would it be possible for this oracle to automate a smart contract ready for signing? So let’s imagine we have a giant database of suppliers, tradesmen, business owners and someone applies for planning permission to build an extension to their house. Let’s say planning permission is granted, would the oracle then be able to instantly source and contact the required suppliers, tradesmen and business owners with a pre-defined smart contract for offer of work? Then once all contracts are returned signed the extension can be built without the person who wanted the extension having to do the leg work themselves? Seems like an efficient system. This week or two I will hopefully be creating the five whitepapers for the forum and locked poll page for the website. I will create the first cold wallet (assuming it's ok to just yoink the ethernet cable) and send the funds over so they're on the ledger. I am still in the process of creating the how-to videos for onboarding people to XRP via XRPTipbot etc. Also the forum needs activating but that can wait until the five whitepapers are ready because there's not much else going on the forum atm. The five whitepapers will take the most time because for two of them I need to visit a load of local charity shops and source a local grower to teach the vegetable growing class! A lot of this is real world leg work so I doubt I will be posting here much during this time. For anyone who is interested this week's blog, Damp Dog, came out yesterday. Short read. So did you learn how to drive by reading a website and tweeting about what to do now that you got on the highway? I'm just saying that in my opinion you'd benefit more from a few driving lessons with a driving instructor than asking a veteran car designer about how a handbrake works. Good luck with your venture and good luck with keeping those keys safe. I'm just saying that in my opinion you'd benefit more from a few driving lessons with a driving instructor than asking a veteran car designer about how a handbrake works. I'm on an XRP forum asking a former Ripple employee how to create an XRP wallet on the Ripple testnet. Pretty certain I'm in the right place. good luck with keeping those keys safe. If I can't then I'll pay someone who can. If you couldn't then it would be too late, because you'd only find out after the fact. Using a hosted and trusted solution like BitGo or Polysign might be a viable solution after initially trying out how your system could work on the TestNet. Wow yes that would be the ideal solution. I browsed Bitgo and their floor for entry is $1 million which is $999,955 more than the current donation wallet has so i can leave them for a while but I have contacted Polysign to find out what their floor is. Thanks for the info.